How many times have you been told "you make the perfect pair"? Too many to count - right? So giving Perfect Pear favors at your wedding or bridal shower is a natural! 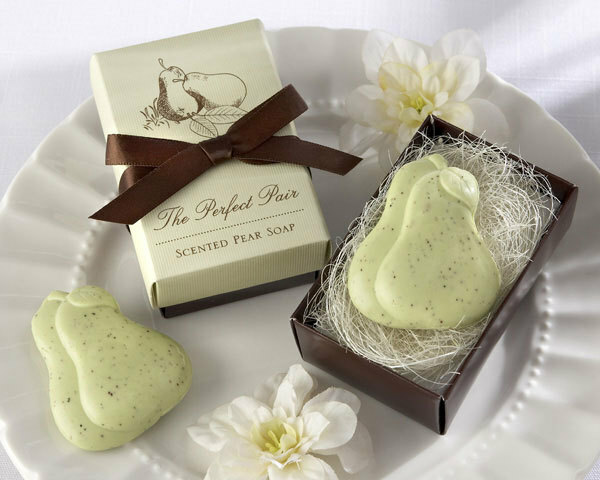 Our perfect pair soap favor is sweetly scented, shaped and colored like a real pear. Our pear favors measure 2 1/4"h x 1 3/4"w x 1/2"d. They come beautifully packaged in an elegantly textured gift box featuring a chocolate brown base and pear-colored cover with a graceful drawing of two pears the words The Perfect Pair Scented Pear Soap. The soap favor gift box measures 3 1/4"l x 2"w x 1 2/4"d and is tied with a chocolate brown, satin ribbon and bow. Just perfect!